It was nearly impossible for me to imagine finding any kind of strength on the other side of a failed embryo transfer. I knew the odds. I knew it could fail. I knew we could lose our precious embryos. I didn't know how I would endure it. Yet here I am on the other side of that loss, finding strength. Growing stronger. I find myself looking at this chapter of my life with great surprise; a sort of third person perspective where I scribble in the margin, "Wow! Resilience!" with an exclamation point because who would have thought this desperate and scared little soul could have survived such a crushing blow? It's been two weeks since that heartbreaking phone call, yet already I am healing. Already my strength is being renewed. I can only attribute this to the supernatural power of Christ Jesus in my life. I feel as though I am learning in a new way the truth of this passage from 2 Corinthians 12, "I pleaded with the Lord to take [my hardship] away from me. 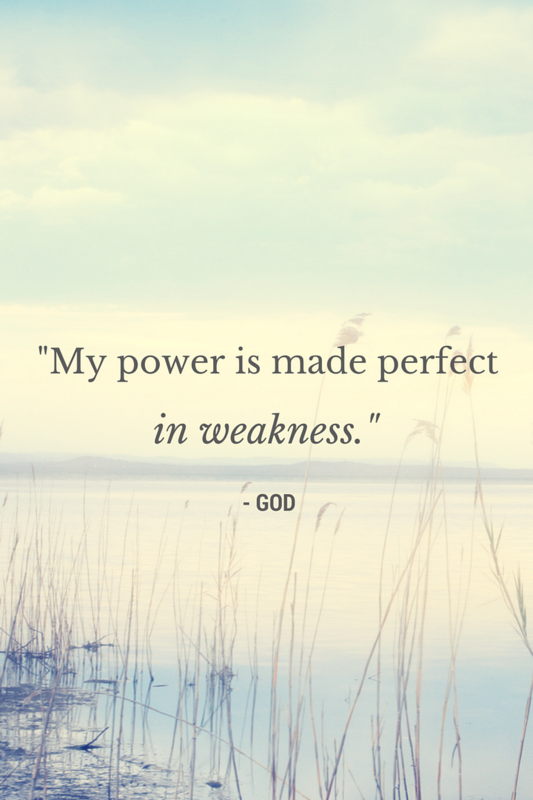 But he said to me, "My grace is sufficient for you, for my power is made perfect in weakness." Therefore I will boast all the more gladly about my weakness, so that Christ's power may rest on my. That's why, for Christ's sake, I delight in weakness, in insults, in hardships, in persecutions, in difficulties. For when I am weak, then I am strong." Cast all your anxiety on me because I care for you. I will fight for you; you need only be still. Yesterday John and I met with Dr. Colbert again. Having practiced reproductive medicine for decades now, he knew the concerns of my heart. Sharing our faith, he was able to speak the truth to me. "You're doing everything right. You've done everything we've asked of you. You let us worry about the rest. You let us figure this out. It's in our hands." Then he corrected himself, "Actually," he said, "it's in the good Lord's hands. We're doing everything we can. It's not for you to worry." God has given me this message five times over the past few days from a unique mix of people: the message that I'm not doing anything wrong. This is not my fault. This is in his hands. It's a message I didn't even know I needed to hear, but a message that has allowed me to find the strength to heal from our loss and move forward with our treatment. Moving forward, I am going to have some labs done to test for a number of blood clotting disorders that can interfere with implantation. With the Thanksgiving holidays coming up here in the US, I'm hoping to get the results back early next week. The transfer schedule at our clinic is all booked up through the new year, which allows us to take a welcomed break from treatment over the holidays. I'll likely start the medication regime for our next transfer in January and have the transfer scheduled in early February. May you find in Christ a strength that surprises you. A reason to hope, a place to rest, and a faith that endures. You have such an amazingly strong outlook on this journey. We continue to pray for you and are here for you. Thank you so much Stephanie. Your support helps me have this outlook! I don't know you personally, I just have been following your story since your adoption (my husband and I are waiting on travel dates to finalize our adoption from Poland). Anyway, I have been listening to a sermon series that is about the verses you quoted in this post. It is by Andy Stanley at North Point Community Church, and is called "In the Meantime: What to do when there is nothing you can do". I think you would find it encouraging! Praying for your family - I know the holidays can be difficult when you are going through such a challenging time. Thanks for continually sharing your story! Thanks so much for the link! I'll have to check it out! So glad to hear you are adopting. I hope everything comes together quickly and you soon have your little one in your arms! I really admire the strength you have shown through all of this. You really are an amazing woman. After I suffered a miscarriage about a year ago, my daughters preschool teacher put things in a nice perspective for me. She told me that 20 something years ago, she too had suffered a miscarriage. She later went on to give birth to a beautiful healthy daughter. She says looking back that if she had not lost that one little life that she would never have come to know this daughter she loves so much and that while we don't understand why at the time, all things happen for a reason. I pray this is the case for you too. That perhaps it hasn't happened yet because the little life that will be perfect for your family isn't ready yet. Keeping you in my thoughts and prayers. I love that verse that says God works all things together for the good of those who love him. In the midst of suffering it can all seem so meaningless but God can put purpose to even the most seemingly hopeless events. Thanks for your comment. Beautiful post! I remember similar feelings after my failed transfer. But resilience came and I'm post-third transfer (only by God's grace). May this one be it for you! Beautiful post. You are an inspiration to me. Thank you for sharing your heart and for understanding how hard the holidays are for us who are struggling with infertility. This is the 4th Christmas that we should have a child at and it's hard. I'll be cheering you guys on in January and thinking of you. We are also starting our new protocol then as well so it will be easy to remember the timing for you. I'm so sorry you are enduring a fourth year with empty arms. It's not fair. I pray the new year brings good news for both of us. Thank you for this post! I'm crying reading it because it's just what I needed to hear. Sterke to you too sweet Jill! That means so much to me Elizabeth! Thank you for commenting! Thank you for this beautiful and brave post. It came into my life at a time that I really needed to read it and have these words fill my heart. God bless you and give you strength and joy.